Other California continental margin seamounts are similar to Davidson in shape, lithologies, and range of ages. They are different from typical ocean-island volcanoes or near-ridge seamounts: they do not line up with each other and are not progressively older like a hot spot chain; they erupted onto much older crust, meaning that they were not associated with mid-ocean ridges. They instead are thought to have erupted along existing zones of weakness because of melting in response to strain on the tectonic plate. 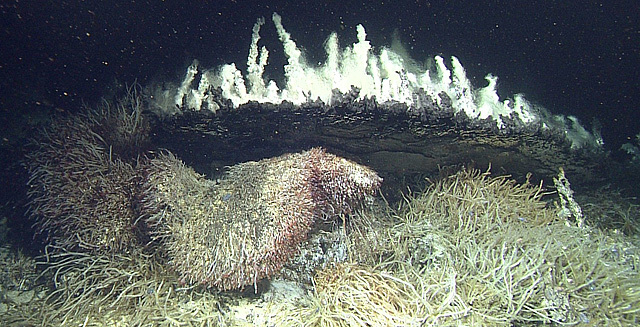 A study of deep sea coral distributions at Davidson Seamount is reported on the eclectic topics page. 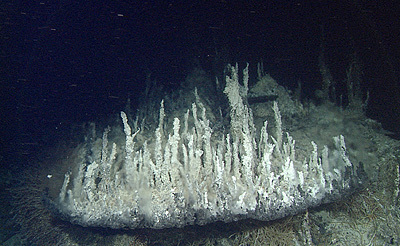 More information about Davidson Seamount is under the MBARI mapping program. This seamount is proposed to become a national marine sanctuary. Xenolith translates to “foreign rock”; it is a clast of another composition entrained in the erupted lavas and can offer clues to the magmatic processes in the volcano. Xenoliths are also discussed in Hot spot: Magmatic processes. OFFSHORE CALIFORNIA – Volcanic samples collected with the Monterey Bay Aquarium Research Institute’s ROV Tiburon from eight seamounts at the continental margin offshore central to southern California comprise a diverse suite of mainly alkalic basalt to trachyte but also include rare tholeiitic basalt and basanite. All samples experienced complex crystal fractionation probably near the crust/mantle boundary, based on the presence in some of mantle xenoliths. Incompatible trace elements, poorly correlated with isotopic compositions, suggest variable degrees of partial melting of compositionally heterogeneous mantle sources, ranging from MORB-like to relatively enriched OIB. High-precision 40Ar/39Ar ages indicate episodes of volcanic activity mainly from 16 to 7 Ma but document one eruption as recent as 2.8 Ma at San Juan Seamount. Synchronous episodes of volcanism occurred at geographically widely separated locations offshore and within the continental borderland. 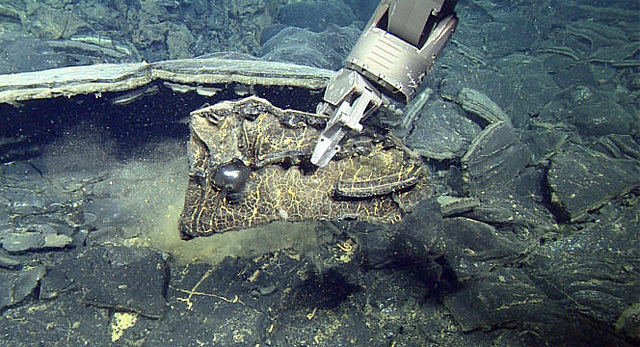 Collectively, the samples from these seamounts have age ranges and chemical compositions similar to those from Davidson Seamount, identified as being located atop an abandoned spreading center. These seamounts appear to have a common origin ultimately related to abandonment and partial subduction of spreading center segments when the plate boundary changed from subduction-dominated to a transform margin. They differ in composition, age, and origin from other more widespread near-ridge seamounts, which commonly have circular plans with nested calderas, and from age progressive volcanoes in linear arrays, such as the Fieberling-Guadalupe chain, that occur in the same region. Each volcanic episode represents decompression melting of discrete enriched material in the suboceanic mantle with melts rising along zones of weakness in the oceanic crust fabric. The process may be aided by transtensional tectonics related to continued faulting along the continental margin. OFFSHORE CENTRAL CALIFORNIA – Seafloor spreading causes abundant magmatism along active ocean spreading centers, but the cause of magmatism along fossil spreading centers is enigmatic. Samples collected from Davidson Seamount, a typical volcanic ridge along an abandoned spreading center in the eastern Pacific, consist of an alkalic basalt to trachyte lava series; transitional basalts were sampled from another part of the abandoned axis, 20 km from the seamount. All samples experienced complex fractional crystallization prior to eruption, but they all share a common, compositionally heterogeneous mantle source. The parental magmas of the transitional basalts were produced from this source at higher degree of melting than those of the alkalic lava series. The composition of Davidson lavas overlaps with those of ridges along other fossil spreading centers and isolated near- and off-ridge seamounts in the eastern Pacific. Together they define a compositional continuum ranging from tholeiitic, normal mid-ocean ridge basalt (MORB)-like to alkalic, ocean island basalt (OIB)-like, similar to lavas that form linear island chains and ridges. We propose that this entire compositional spectrum of intraplate lavas that do not form linear volcanic chains in the eastern Pacific results from variations in the degree of partial melting of a common, compositionally heterogeneous mantle source. This source consists of more easily melted, geochemically enriched components of varying sizes and amounts embedded in a depleted lherzolitic matrix. Large degree of partial melting produces normal MORB–like melts represented by some near-ridge seamount lavas, whereas small degree of melting produces OIB-like fossil spreading center lavas. The small degree of partial melting beneath recently abandoned spreading centers results from either buoyancy-driven decompression melting of the hot lithospheric and asthenospheric mantle material beneath active spreading centers or rapid motion, with respect to the underlying asthenosphere, of abandoned spreading axes that are thickening over a fertile mantle. Mid-Tertiary volcanic rocks in coastal California, which are compositionally akin to intraplate lavas, are interpreted to be small degree partial melts of the same compositionally heterogeneous sub-Pacific mantle that has upwelled through windows in a subducted slab. OFFSHORE CENTRAL CALIFORNIA – Davidson Seamount, a volcano located about 80 km off the central California coast, has a volume of ~320 km3 and consists of a series of parallel ridges serrated with steep cones. Davidson was sampled and its morphology observed during 27 ROV Tiburon dives. During those dives, 286 samples of lava, volcaniclastite, and erratics from the continental margin were collected, with additional samples from one ROV-collected push core and four gravity cores. We report glass compositions for 99 samples and 40Ar-39Ar incremental heating age data for 20 of the samples. The glass analyses are of hawaiite (62%), mugearite (13%), alkalic basalt (9%), and tephrite (8%), with minor transitional basalt (2%), benmoreite (2%), and trachyandesite (2%). The lithologies are irregularly distributed in space and time. The volcano erupted onto crust inferred to be 20 Ma from seafloor magnetic anomalies. Ages of the lavas range from 9.8 to 14.8 Ma. The oldest rocks are from the central ridge, and the youngest are from the flanks and southern end of the edifice. The compositions of the 18 reliably dated volcanic cones vary with age such that the oldest lavas are the most fractionated. The melts lost 65% to nearly 95% of their initial S because of bubble loss during vesiculation, and the shallowest samples have S contents similar to lava erupted subaerially in Hawaii. Despite this similarity in S contents, there is scant other evidence to suggest that Davidson was ever an island. The numerous small cones of disparate chemistry and the long eruptive period suggest episodic growth of the volcano over at least 5 Myr and perhaps as long as 10 Myr if it began to grow when the spreading ridge was abandoned. SOUTHERN CALIFORNIA – Many seamounts world-wide exhibit features that suggest they were once islands. Rodriguez and San Juan Seamounts and Northeast Bank, within 250 km of the continental margin of the western US, were explored with the ROV Tiburon and found to have guyot morphology, beach deposits and erosional features, degassed volcanic lavas and pyroclasts, and cooling and alteration patterns unusual for submarine erupted lavas. These features are evaluated as evidence that the volcanoes stood above sea level. The summit of Rodriguez Seamount is a smooth, gently domed platform. Rough hills stand above the platform and consist of dense, degassed ‘a‘a flows erupted subaerially. Bedded sandstones and rounded cobbles interpreted to be beach deposits occur near the top of a major break-in-slope at about 700 m depth. The summit of Northeast Bank is also a smooth, gently domed platform. Beach deposits were observed just below the pronounced break-in slope at about 500 m. The summit of San Juan Seamount is a northeast-southwest trending series of rough ridges rather than a dome. However, subaerially exposed ‘a‘a-like lava flows were found above 700 m. Oxidized olivine, degassed volcanic glass, and secondary phosphatization of the lavas are found both shallower and deeper than the breaks-in-slope, and their presence may not be robust indicators of subaerial exposure. Rodriguez stood at least 70 m above sea level and formed a small island 6.8 km2 in area prior to subsiding at least 700 m. Northeast Bank was a large island perhaps 200 m above sea level and 90 km2 in area. The summit ridge of San Juan emerged as a line of eight small islands with a total area of about 2.8 km2, and the tallest island rose at least 140 m above sea level. The subsidence of Northeast Bank within the California borderland, Rodriguez Seamount on the continental slope, and San Juan Seamount on the adjacent ocean crust occurred since they formed 7 to 11 million years ago. The minimum subsidence is consistent with cooling and contraction of the underlying lithosphere. CALIFORNIA CONTINENTAL MARGIN – A diverse assemblage of small mafic and ultramafic xenoliths occurs in alkalic lava from Davidson and Pioneer seamounts located at the continental margin of central California. Based on mineral compositions and textures, they form three groups: (1) mantle xenoliths of lherzolite, pyroxenite, and dunite with olivine of >FO90; (2) ocean crust xenoliths of dunite with olivine <fO90, troctolite, pyroxenegabbro, and anorthosite with low-K2O plagioclase; (3) cumulates of seamount magmas of alkalic gabbro with primary amphibole and biotite and anorthosites with high-K2O plagioclase. The alkalic cumulates are genetically related to, but more evolved than, their host lavas and probably crystallized at the margins of magma reservoirs. Modeling and comparison with experimentally derived phases suggest an origin at moderate pressures (~0.5-0.9 GPa). The high volatile contents of the alkalic host lavas may have pressurized the magma chambers and helped to propel the xenolith-bearing lavas directly from deep storage at the base of the lithosphere to the eruption site on the ocean floor, entraining fragments of the upper mantle and ocean crust cumulates from the underlying abandoned spreading center. CALIFORNIA CONTINENTAL MARGIN – Hyaloclastite deposits are abundant on mid-Miocene volcanic seamounts offshore central California. The glass compositions are predominantly evolved hawaiite and megearite, although minor amounts of tholeiitic to alkalic basalt are also present. Textural features give evidence for different eruption styles. For the evolved, alkalic compositions, fragmentation occurred primarily in response to exsolution of magmatic gases as the magma approached and erupted on the seafloor. Textural features of pyroclasts suggest formation of lava fountains of limited size and height, depending on water depth. Monomict, clast-supported hyaloclastite of highly vesicular pyroclasts suggest limited dispersal and deposition near vent sites. Matrix-supported, polymict breccias are reworked and displaced by currents into deeper water. The narrow range of glass compositions extending over multiple layers of volcanic sandstone suggests deposition from a slurry of tephra and water directly related to an eruption. Basaltic hyaloclastite of vesicle-free, angular glass fragments from the deepest site apparently formed from quench granulation. Sulfur contents suggest eruption depths ranging from near sea level to over 2000 m for samples collected from 1300 to over 3400 m depth, implying large amounts of subsidence for these seamounts. Reference: A.S. Davis and D.A. Clague (2003) Hyaloclastite from Miocene seamounts offshore central California: compositions, eruption styles, and depositional processes, in: Explosive Subaqueous Volcanism, J.D.L. White, J.L. Smellie, and D.A. Clague (eds), Geophysical Monograph 140, American Geophysical Union, 129-142. CALIFORNIA CONTINENTAL MARGIN – Davidson, Guide, Pioneer, Gumdrop, and Rodriguez seamounts are located at the continental margin offshore California between latitudes 37.5oN and 34oN. They may represent a previously unrecognized type of intraplate oceanic volcanism. They are morphologically unlike typical ocean island volcanoes or near-ridge seamounts: they consist of a series of cones aligned along parallel ridges separated by sediment-filled troughs, and lack pit craters, summit calderas, or isolated cones. They are oriented northeast-southwest, perpendicular to the direction of plate motion but parallel to the structure of the underlying oceanic crust. 40Ar/39Ar laser fusion ages of minerals separated from the lavas indicate at least two episodes of volcanism at ~16 and ~12 million years ago, younger by 7 to 10 million years than the underlying ocean crust. The rocks are predominantly differentiated alkalic basalt, hawaiite, and mugearite. They lack coherent liquid lines-of-descent, consistent with small batches of magma forming, fractionally crystallizing, and erupting in isolation from the previous and subsequent batches. The presence of mantle xenoliths suggests that magmas originated in the upper mantle, and xenoliths of alkalic cumulates and xenocrysts of feldspar, amphibole, and titanomagnetite are also consistent with fractionation in the upper mantle. Sr, Nd, and Pb isotopic ratios of some samples are from MORB-like depleted mantle sources; others indicate more variably enriched mantle sources. Abundances of highly incompatible elements, such as Nb, Ta, and Th, suggest that magmas formed by small percentage partial melting of variably enriched MORB-mantle. Basalts erupted onshore in coastal California during the mid-Miocene, coeval with those of the seamounts offshore, have a similar isotopic range but trace elements show a subduction-related signature of crustal contamination. The onshore basalts are proposed to have ascended from shallow crustal reservoirs in a window behind a descending subducted slab. The chemistry of the volcanic rocks offshore, however, was not influenced by a slab component. Although a slab-window origin is plausible for the mid-Miocene volcanism, later episodes of small, sporadic eruptions on- and offshore probably resulted from decompression melting of mantle rising along existing zones of weakness undergoing extension related to continued movement along transform fault systems.